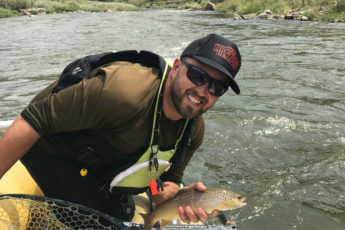 The Arkansas River in Colorado provides Gold Medal fly fishing for Brown and Rainbow trout. Your fly fishing trip will be unique – you’ll be floating the river by raft! You will experience some of the fastest dry fly action in the West for predominately 10″ to 16″ Browns. We begin in late April with our famous Caddis fly hatch and continue into the fall, fishing with attractor and terrestrial patterns. We take you to feeding and holding zones accessible only by raft as we drift through private and public lands. We drift within casting distance of trout other anglers only dream about! Our float fishing trips show you a side of the Arkansas few experiences – no crowds, beautiful sunsets, wildlife and fishing where walk / wade anglers can’t reach due to private land, difficult hikes or swift currents. We promote catch and release with single barbless hooks. Only flies or lures are allowed – no bait! Anglers should be proficient in casting skills to ensure a rewarding experience. Novices should consider our instructional fly fishing course prior to float fishing.